Balboa Village Visitor Information Center grand opening at the Village Place! 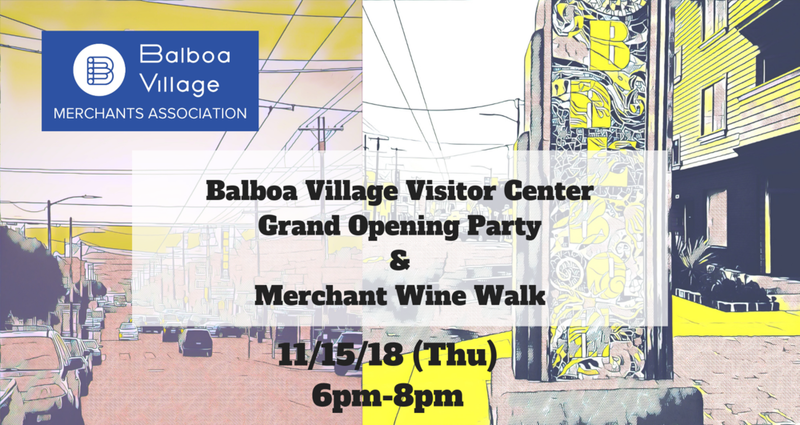 To celebrate the opening and support the #shoplocal (One of our One Richmond Principles) movement for the holidays, the Balboa Village Merchants Association is hosting a merchant wine walk starting at the Village Place and all around our member merchant locations! Please be over 21 years old to consume wine at the locations. There will also be a party for celebrating the opening with food from Cassava! Participants can also enter the raffle drawing for a gift package of gifts from our merchants members including BVMA original t-shirts, BlueStone Pottery's "Outer Richmond" line mug and more!